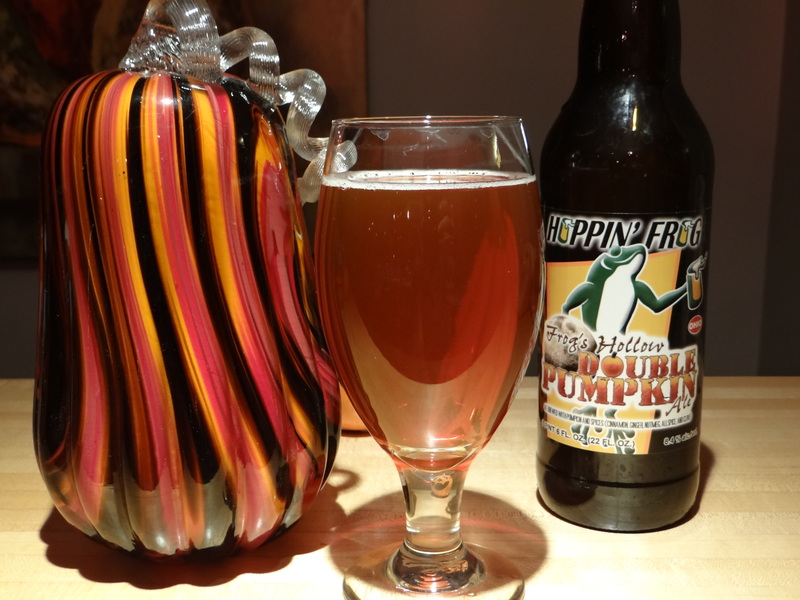 As Halloween comes and goes the pumpkin beers are rapidly giving way to the Christmas beers. As a new beer blogger it seemed my duty to sample a variety of pumpkin beers and offer up my opinions. Back in early October that seemed like a good idea, but after starting the project the appeal of drinking pumpkin beers night after night became steadily less appealing. I got sidetracked on Saisons, then there was the IPA taste test, and then I started researching and drinking sour beers. Maybe I don’t have the discipline to be a beer blogger after all, but like a professional I’m going to push on. Midnight on all hallows eve will soon be upon us and if I don’t post this now the deal I made with Lucifer to get this gig as a beer blogger could come unraveled far before the appointed time. 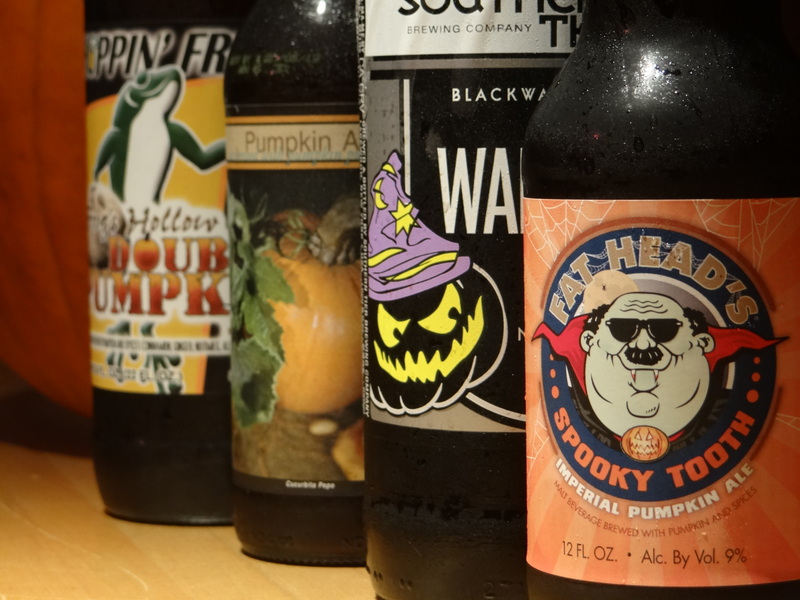 Below are the treats and tricks from this year’s batch of Pumpkin beers. Listed in order from best to worst. Full reviews of many of these beers exist over in the beer reviews section of the blog. Let the pumpkins fly and the cinnamon, allspice and nutmeg rain from the sky. Smells like the other pumpkin beers with the requisite spices (the brewer lists cinnamon, nutmeg, cloves and pumpkin puree as ingredients), but the taste sets it apart from the other contenders. The pumpkin pie taste is matched by a healthy dose of black peppery spiciness, like you might get in a hoppy pilsner or saison. The pumpkin-hop combination works surprisingly well with the hops taking the sweetness out, a fatal flaw in many pumpkin beers. The mouthfeel is nice and creamy with a dry finish. Plus at $8.49 per six-pack this is not only the best pumpkin beer I tried this season, it’s the cheapest. I feel like this might be the only time in the history of this blog I will get to type that sentence. Punkin has been around since before pumpkin beers were very prevalent. 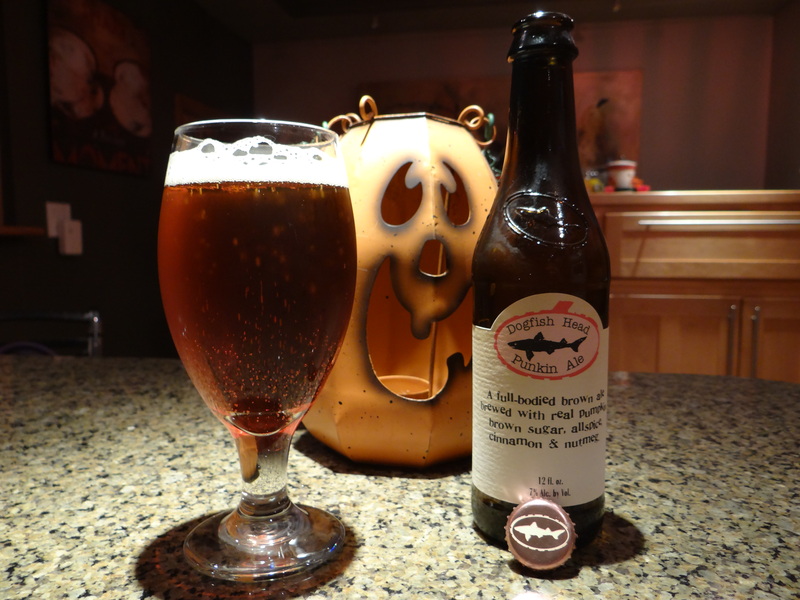 According to the DFH website its origins (1994) even predate the opening of the Dogfish Head Brewery. 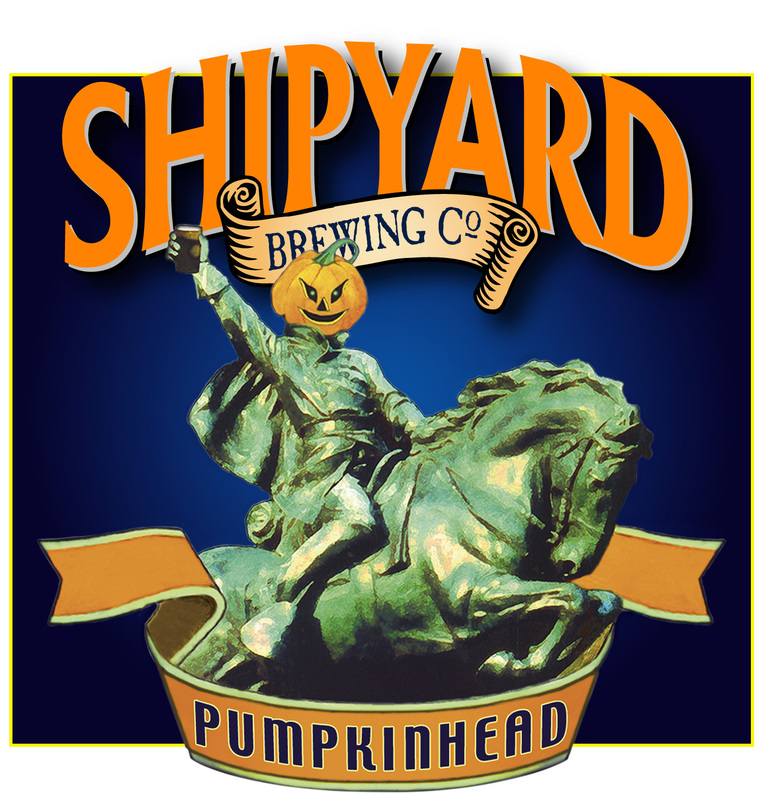 If you are a fan of pumpkin beers you probably already have an opinion on this beer. My opinion is that the pumpkin and spice flavors and aromas are dialed in just about right to make a well balanced, easy to drink beer. Visually it was my favorite, the beer was as clear as an orangish-brown beer can be. This one comes close to the Smuttynose, however, in my opinion the base beer used for Punkin is not as interesting as the Smuttynose base beer. In terms of price the verdict easily goes to Smuttynose. 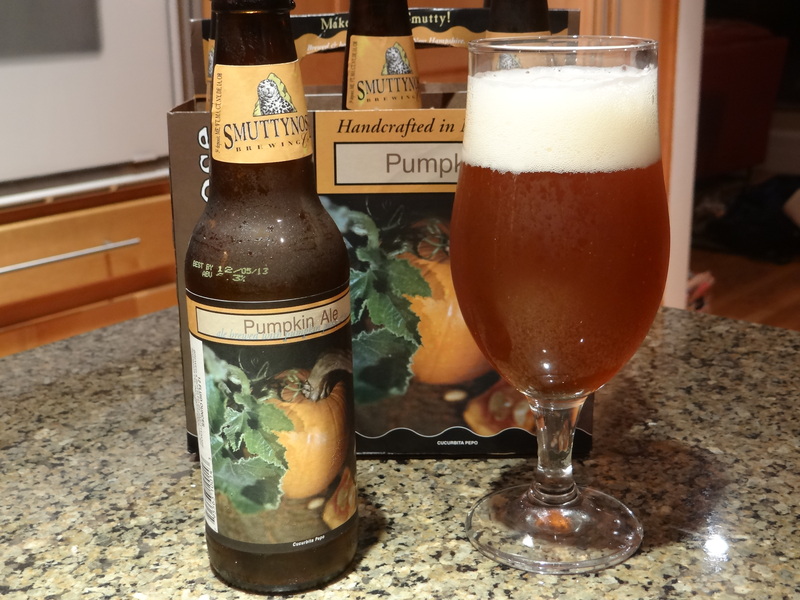 So it’s a unanimous decision for Smuttynose, but don’t despair if you made a compulsive Punkin purchase tonight, it’s still a classic in the world of pumpkin beers. An Ohio brewed entry by Hoppin’ Frog Brewery up in Akron. This beer took home a gold medal from the Great American Beer Festival in 2011, and on a per ounce basis it’s the most expensive beer in the line-up. So my expectations were high. It was the best smelling beer of the group—allspice, pumpkin, and pie crust from the malts stand out, but curiously it poured with almost no head. For such a strong beer the alcohol is well hidden and the pumpkin/spice tastes make their presence known without overpowering the beer. The drinkability remained high over the course of a 22 oz bottle. A perfectly fine beer but if I’m going to lay down $9 for a bomber I expect a beer I can get excited about. Despite the gold medal I put this a notch below Smuttynose and Punkin. Another Ohio brewed high ABV pumpkin beer. Fat Head’s brewery outside of Cleveland is known for making great IPAs. This beer shares many of the same characteristics as Frog’s Hollow—a high abv strong ale that pours a clear amber-orange color with minimal head—but where the two differ Spooky Tooth comes out on the short end of the stick. 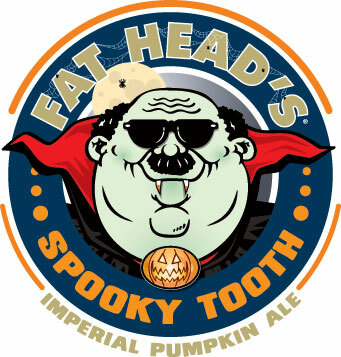 Spooky Tooth is less aromatic and the pumpkin flavors are very subtle, so much so that this is really more of a spiced strong ale than a pumpkin beer. On the plus side it does have a cooler label, and really isn’t that what counts in the end anyway. Among pumpkin beers Pumking by Southern Tier is one of the best known and most venerable. Quite a few people rate it as their favorite pumpkin beer, while others don’t care for it in the least. If you like your pumpkin beers to be the epitome of a pumpkin pie in beer form then Pumpking is a must try. 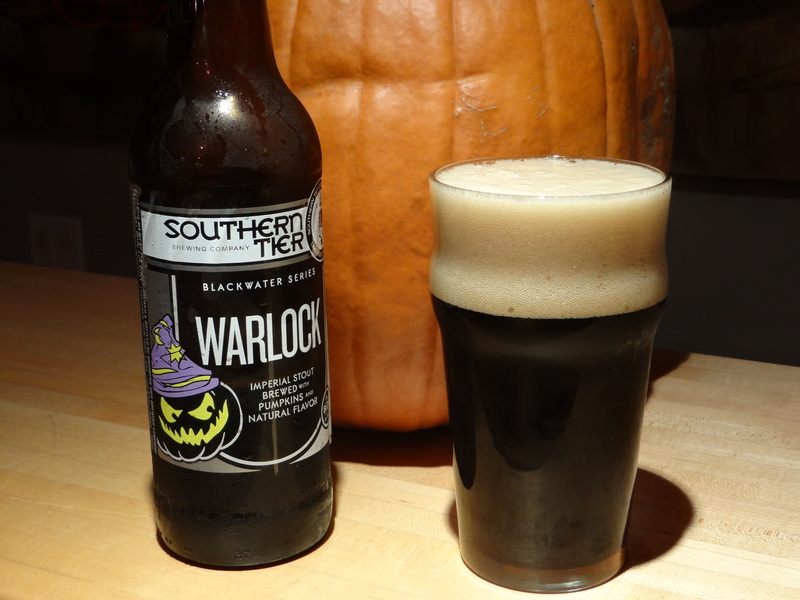 This year Southern Tier released a new pumpkin beer, Warlock, billed as an imperial stout brewed with pumpkins. In the abstract the combination of pumpkin pie and chocolate sounds tasty. My experience with this beer was an interesting one. The pumpkin character is dialed back when it is cold, which allows the chocolate malt flavors get the upper hand in the smell, and the chocolaty stout and the pumpkin pie flavors share equal billing in the taste. Interestingly as the beer warms the pumpkin character gets the upper hand, so much so that by the end of the beer I think it would be hard to distinguish it from Pumking (if blindfolded). Like Pumking your view on this beer depends very much on how you like your pumpkin beers. I find it tasty in small doses, but I had a hard time finishing the whole 22 oz bottle. Accordingly my rating dropped by about 1 point due to the fatigue factor. You could go down to the store and lay down $9 for a 6-pack of Pumpkinhead or you could buy a 12 pack of Bud Light for a similar price, add some cinnamon, allspice and nutmeg and get something pretty similar. I ended up using the last two bottles to invigorate the compost pile. If you are reading this somewhere outside of Ohio you might have access to different beers. Here are some that I could not find but you might want to try. If you are in the northwest Elysian Brewery in Seattle is famous for pumpkin beers like The Great Pumpkin or Dark o’the Moon. In the southeast Cigar City Brewing in Tampa makes the top rated pumpkin beer on Beer Advocate, Good Gourd Imperial Pumpkin Ale. In the midwest Schlafly Pumpkin Ale is a popular choice among beer geeks. In the southwest LABeerScene gave a strong recommendation for Ace Pumpkin Cider.